Matthew 5:5 says: Blessed are the meek, for they will inherit the earth. The definition of meek is “quiet, gentle, and easily imposed on; submissive.” These are all wonderful and endearing character traits. As wives, we are called to be a gentle quiet spirit and submissive to our husbands. This makes it very hard to know when and HOW to stand up for ourselves properly and respectfully in a God pleasing way. 2 Timothy 1:7 says For the Spirit God gave us does not make us timid, but gives us power, love, and self-discipline. Amen! This tells me that the Holy Spirit will speak to us and give us the words and strength to stand up, speak up, and make necessary changes. He has done this for me and I pray He continues to. 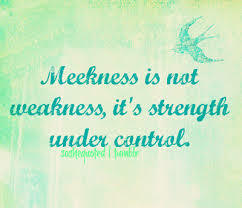 Do not mistake meekness, kindness, or humility for weakness. It takes a lot more strength to respond with these virtues in certain situations than it does to retaliate in anger and hostility. We are not called to be doormats, but we are called to demonstrate self control. It’s a delicate balance. When we do stand up, the relationship may end. We may get rejected. We may even get blamed. But, when we wonder what decisions to make, it helps immensely to ask ourselves what decision we would want our children to make if they were in the same situation. We would never want them to be walked on, disrespected, or used. They are much too valuable! They deserve better! Well, so do we. God sees us the same way, we are His children. His spirit WILL give us the wisdom, power, and words to stand up when necessary and there are times when it IS necessary.